PFM HQ - Terry Bledsoe continued working on the PFM HQ entry deck. He and Dave Miller cut down a bunch of lumber to make railing additions. Terry made a great start on getting those fastened to the deck railing. Dave Edgerly started working over the T-1 Le Rhone rotary engine. When the disassembly of T-1 started in the shop we discovered a huge mud dauber's nest up under the cowling completely covering one of the cylinder's valve actuation mechanism! Dave started cleaning up the engine and preserving it to prevent rust while the airplane is overhauled. A small army of folks started covering one of T2's lower wing panels. 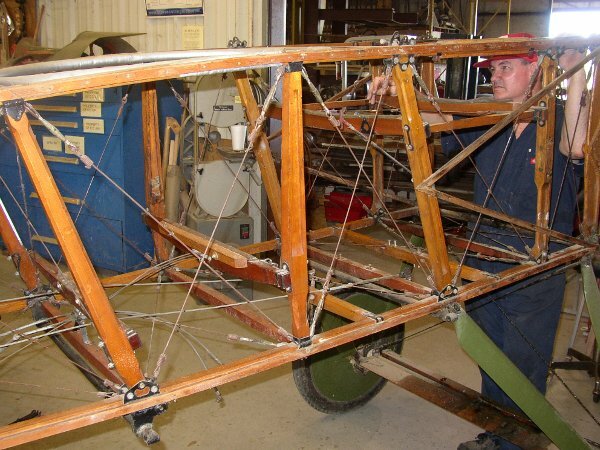 Cheesecloth was added to the leading edge cover, rib braces were added, and the cover was fitted. After stitching the wing root trailing edge curve the envelope was glued to the wing root rib. The cover was shrunk and the first coat of dope was added. Rib stitching will be the next major step! Folks involved on this project were Joe Pantemuhl, Dave Orloff, Dave Edgerly, Dave Miller, Steve Freeman, Roger Freeman, Billy Cheshire, and Richard Smith. Heavens knows I may have missed one or two! Sorry if I did, guys! Ron Marcotte and Sanford Swope worked on the belly formers for T1. Ron has been leading the effort to get this part fixed up - and it has presented several interesting challenges!! Ron about hit the roof when it transpired that there were differences between T1 and T2 (two additional formers on T2!) and then we couldn't find T2's belly former unit. (Roger had stored it in the attic for safe keeping!) Ron and helpers have pretty much completed parts inspection/repair & fabrication and are in the process of re-assembling the piece. 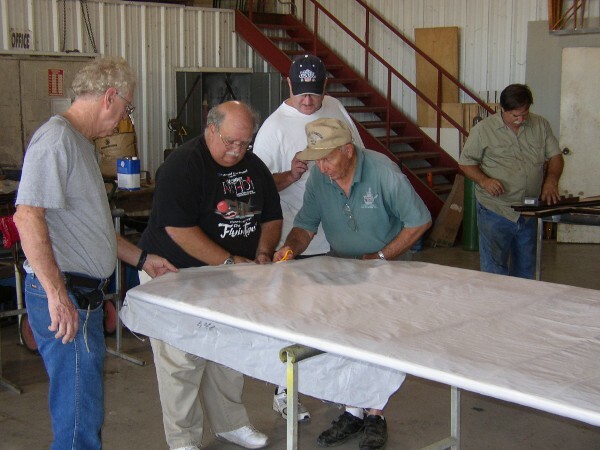 Don Larson and Joe Pantemuhl continued working on T-2's fittings. They learned that MEK dissolves built up castor oil, revealing that "rusty" metal components were actually sound. Next step for T-2's fuselage will be varnishing the wooden components. Myself, Dave Miller, and Mike McCormick finished the basic stripping of T-1's fuselage so it can be properly cleaned and inspected/repaired. All cockpit fittings and furnishings were removed along with the firewall and engine mount spiders. What is left is basically a bare wooden fuselage with cross bracing wires. For maximum efficiency the undercarriage will be removed as well which will allow the fuselage to be rotated as required. Roger Freeman pointed out original serial number stampings on one of the fuselage's main verticals. Very cool!! The engine mount spiders were both coated in castor oil, and when set aside the front spider had loose oil sloshing around in its pockets which started leaking out onto the floor. The other one had a massive mud dauber's nest on its backside. Lots of work needing to be done on the T1 fuselage! Doug Hortvet spent the day working on the Indian motorcycle. Last time around it was identified that the fuel tanks were leaking, so Mike McMains was recruited to repair the units (he knows them best as he fabricated them!). The tanks were waiting for Doug when he arrived. Not real sure exactly what Doug got accomplished, but the Indian was looking way more "whole" than it has in awhile!